Click on this image for the full size (med) version. This makes a great desktop wallpaper. Who says that every evangelistic conversation has to be lengthy? Is there anything wrong with simply planting a small seed? What about leaving somebody thinking about sin and judgment without being able to finish up with a presentation of the gospel? 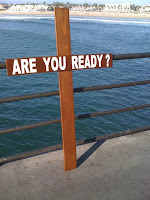 Last night I stood on the corner of Ortega and Camino Capistrano in San Juan Capistrano with my "Are You Ready" cross. As I was standing there, a car pulled up to the red light and came to a stop. I could see the passenger staring at the cross. He leaned out the window and shouted, "ready for what?". I walked over to the car and said, "Eternity! If you died today where would you go?". He replied, "Heaven of course". I asked him why God should allow him into heaven. He said, "because I'm a good person", to which I replied, "Have you kept the ten commandments?". "Yeah, I think so" was his answer. "Have you ever told a lie?" I questioned. "Yeah, but God won't send somebody to hell just for telling a lie" said the now concerned man. At this point, the light changed green and I said "The bible says God is going to judge in righteousness.". As the car pulled away from the light I could hear him say, "Oh, wow!" in a very sober tone. As I walked back to my spot on the corner I couldn't help but think that this was not a fruitful encounter. Sure I had challenged his worldview that you can earn your way into heaven by being a good person, and our short conversation obviously had an impact on this man. BUT, was this "preaching the gospel"? I didn't even get to tell him about Jesus' work on the cross. I didn't get to tell him that God the Father sent His Son to earth, fully God and fully man, to live a perfect life, to suffer and die on the cross taking the punishment for our sins so that God could legally dismiss our case if only we will repent and trust in Him. I didn't get to tell him that Jesus rose from the dead after three days thereby defeating death. I didn't get to tell him that God so loved the world that He sent his only begotten Son that whoever believes in Him shall not perish but have everlasting life. 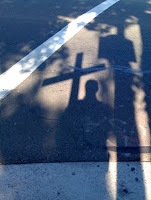 I didn't get to tell him that He made Him who knew no sin to be sin for us that we might become the righteousness of God! The Gospel... I didn't get to tell him the Gospel!! ... or did I? Is not the Gospel that Christ died for our sins according to the scriptures, and that He was buried , and that He rose again the third day according to the scriptures? Is the law and sin and judgment not part of the Gospel? After all, sin is transgression of the law. Was not this man left with a part of the Gospel ringing in his ears? 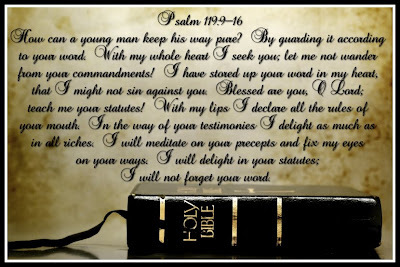 Is the law not a schoolmaster to bring us to Christ? Also, is this not exactly how Jesus left His conversation with the rich young ruler in Luke 18? Jesus went through the law with this man, then showed him that he had fallen short of it's requirements, and left it there. The rich young ruler left his conversation with Jesus feeling sorrowful. Does not godly sorrow produce repentance? I would have loved to have continued the conversation with this man, but I trust that God's word will not return void and that the Holy Spirit will continue the work on this man. After all, it is He who brings the increase!